Until 14 April there’s a deal on the Volkswagen Polo, with £500 off, competitive finance packages, three years’ free servicing and free insurance*. As an example, the entry-level Polo S 1.2-litre 60 PS three-door model costs just £9,495, including £500 off. With Volkswagen Finance’s popular Solutions PCP package, this means monthly payments from £99 per month** – including up to three years’ or 30,000 miles free servicing (7.9 per cent representative APR). One year’s free insurance is also included for drivers over 21 years of age, completing an impressive package for customers. This offer applies to all Polo models purchased from stock through a Volkswagen UK Retailer and registered before 14 April. If a customer chooses an alternative funding method, the standalone servicing package is available for £299. The latest and fifth generation Polo was launched in October 2009. Shortly afterwards it was named European Car of the Year 2010, and in April, added the accolade of World Car of the Year 2010. 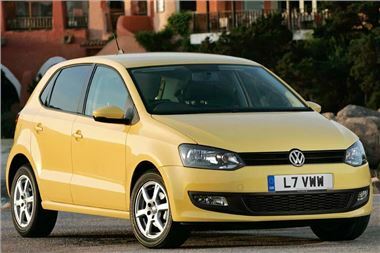 Volkswagen UK sold 45,282 Polos last year, making 2010 the car’s best-selling year since 2003. For full details and T&Cs, visit your nearest Volkswagen Retailer, call 0800 333 666 or go to www.volkswagen.co.uk/polo. *Terms and conditions apply. Available to Retail customers only and available on Polo models from stock. £500 off excludes GTI and BlueMotion. Free insurance available until 14 April 2011 from Volkswagen Insurance for drivers over 21 years, excludes Northern Ireland and excludes BlueMotion and GTI models. Volkswagen Insurance is sold, underwritten and administered by Allianz Insurance PLC. Polo S 1.2-litre 60 PS 3-door. Offer applies to new Polo S 1.2-litre 60 PS 3-door only, sold and registered before 31 March 2011. Retail sales only. Subject to vehicle availability. *Payable as first payment. **Payable with optional final payment. #4.32p per mile excess mileage charges apply. Further charges may be payable if vehicle is returned. Indemnities may be required. Subject to status. Available to over 18’s from participating retailers only. Volkswagen Finance, Freepost Volkswagen Finance. Offer may be varied or withdrawn at any time. prices quoted and example shown is correct at time of going to press and reflects 20% VAT.